Here's what you should REALLY know before move in! MYTH: I’ll be charged a fee for moving in on the first day of Hunker Down with Housing. TRUTH: This year, there is no early move-in option requiring a fee. Contracts begin on August 12 and move in is open to all students. However, in an effort to reduce wait times and crowds, we are encouraging students not participating in Greek recruitment to move in on August 13 or later. MYTH: I have to move in to the residence halls August 12-13. TRUTH: Students may move in at any time through the first day of classes once we open our doors at 8 a.m. on August 12. Hunker Down with Housing, our annual move-in event, will be held on August 12-13 and is a designated time where student and staff volunteers are on hand to assist with needs during the move-in process. After August 13, our residence hall staff will remain on standby to assist students moving in at any time. In the past, residents have been able to move in with ease by waiting to arrive later in the week. MYTH: My PIN is not working to purchase my football tickets… something must be wrong. TRUTH: The PIN (Personal Identification Number) that you must set up to access the residence halls is completely separate from the online PIN system needed to register for athletic tickets. 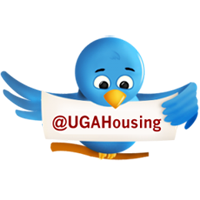 To access the residence halls you must swipe your UGACard and enter the housing access PIN that you selected at housing.uga.edu/access, then press #. For information regarding your online PIN for athletic tickets, please contact the Main Ticket Office at 706-542-1231. MYTH: I didn’t get a room change before move-in week and the request period has ended. TRUTH: The request period for room changes has been temporarily placed on hold during the move-in process. However, the room change request process will begin again on the first day of classes and you can also request a room change at any time during the year. Do you know of any other move-in myths or rumors that we should address? Share them in our comments and we’ll get back with an answer by the next business day.